Poached in butter with garlic, wine, Parmesan cheese and spices on the grill – out of this world! While the word scampi is actually the Italian plural of scampo (meaning prawn), it is often used to describe the preparation of the dish typically prepared with shrimp or lobster. My recipe for it borrows from the shrimp scampi preparation and poaches the oyster in the shell on the grill, surrounded by melted butter, white wine, parmesan cheese and minced garlic and Croix Valley Garlic Barbecue Booster. 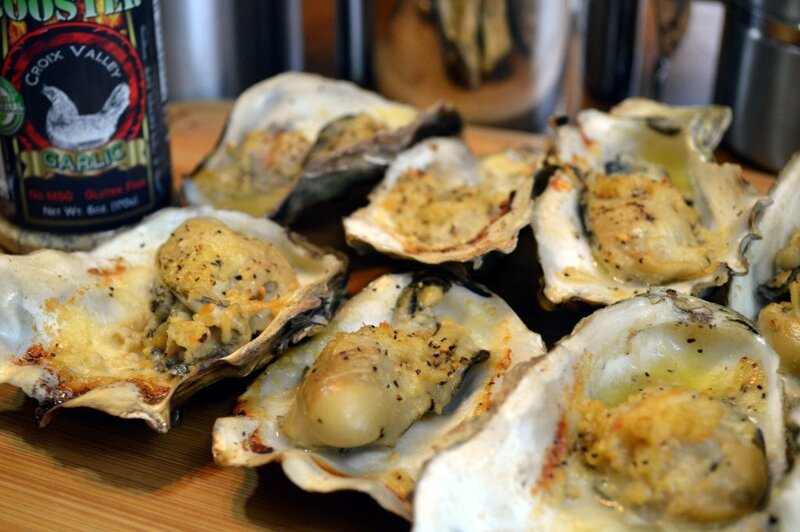 Once you get past the labor of shucking the oysters, this delectable appetizer will enliven the taste buds with the sweet and succulent meat of this delicacy. Begin by shucking oysters. Unhinge flat part of shell and detach oyster meat. Rinse in cold water and place back in shell. Place 1 Tbsp. butter under the oyster meat. Place about 1/2 tsp. of minced garlic on top of oysters. Top with approx. 1/2 teaspoon grated Parmesan Cheese and a hefty pinch of Grated Parmesan Cheese. Pour 1 teaspoon white wine over it and sprinkle on Barbecue Booster. Click on this to get the sauce. Place on 375 degree grill over direct heat. As butter melts, it will begin to poach the oysters. Cook for about 10 minutes until the liquid in the shell has reduced by half and the itbegin to firm.